A niche deal here but those of you in the trade will see how good this little glitch is. Any resellers here who sell overseas? I have just sent a large Mirrors Edge Catalyst Collectors 5.8kg package 49cm x 39xm x 35cm to Hungary via Parcelforce Priority for just over £15 (should be about £100) I think they have a glitch on their website. One in the link shows a bit more expensive than mine at nearly £20 (mine was about £15 inclusive of VAT) probably due to I put a larger parcel in for the screen print than I sent, but shows glitch, worth trying for other countries. So just a heads for you Ebay sellers to check the Parcelforce website and get a bargain before they correct it! 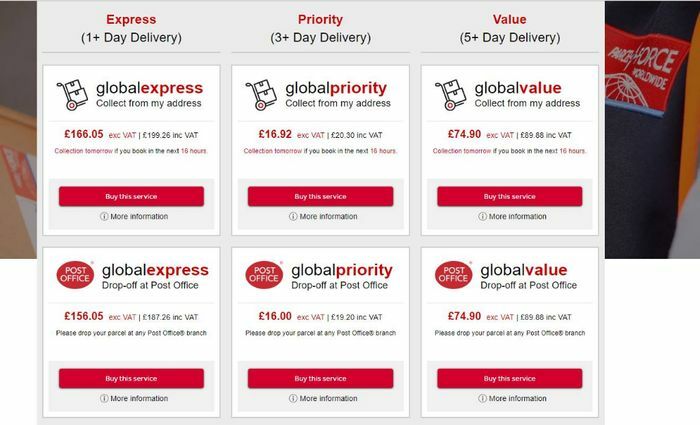 What do you think of this Parcelforce Worldwide deal? This is online only, not in the Post Office as I asked the price at the counter to see if ti was different (never told her my price) and she gave me the full price. I posted mine yesterday and saw the glitch on Tues, so lasting a decent while. Just done a few different countries and only Hungary showing the glitch, looks like I just got mega lucky, would have preferred the lucky win on the lottery but can't complain really.